There's a few more photos here. I shouldn't reveal my sources really. But then this was an exceptional case and I don't expect it to be repeated any time soon. 99p. OK, plus £5 postage but still, 99p. Ebay. Expect to pay more. I could not believe my luck. 99p and with it not only did I get Volume 58 but I also completed the 1960s section of my collection. Probably the best era for Penrose…maybe the best era for the graphic arts in general (at least from an historical point of view). Printing, patterns, building and more printing. Can't remember where I saw it but last week I read one of those supposed "trend reports" for this year. 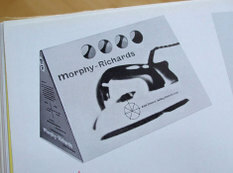 Amongst the rest of the unsubstantiated claims was that 2012 would see a lot of "objects as typography". Just like they did in 1969. Hard to beat. 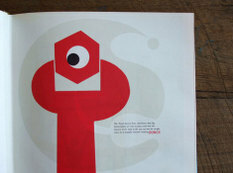 You can see more 1969 cutting-edge typographics here. 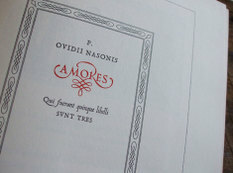 Over the past few years I've been trying, extemely slowly, to catalogue highlights from my Penrose Annuals. Most of mine span from around 1958 up to 1970; a golden era for both typographic/graphic design and break-throughs in production technology. 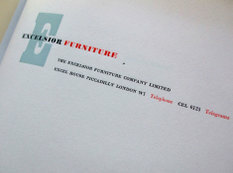 It's the period that straddled the move from letterpress to photocomposition and represents the heady rise of the industry. 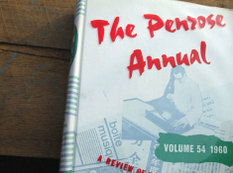 If you're not up to speed, the Penrose Annual was first published in 1895. 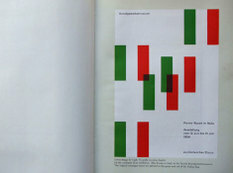 A review of the graphic arts, from a couple of years later it was issued by Lund Humphries every year until 1982. A weighty volume, each book was packed full of a multitude of articles recording techniques, styles, applications and technical advances. • Typographic design and a new device called the "computer"
I've uploaded a load more images to Flickr and you can take a look back on the other volumes I've featured here. Hot on the heals of Volume 56 comes 58 with some more amazing content. Including a great piece by F H K Henrion on the rationalization of papers and inks (accompanied by pages from his catalogue for Simplex Piling); a facsimile copy of Werkman's The Next Call 9; some excellent and detailed stuff on map design; and a superb fold-out promo for a (then) new-fangled typeface called "Univers" (it'll never catch on). 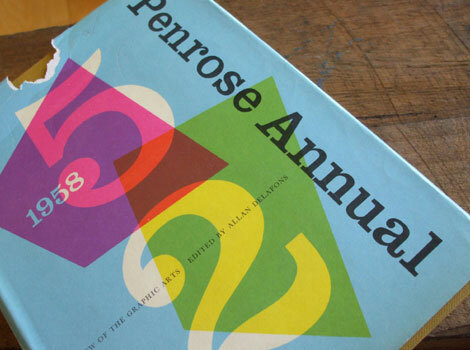 It's taken me gawd-knows-how-long to get around to uploading another Penrose Annual to Flickr. 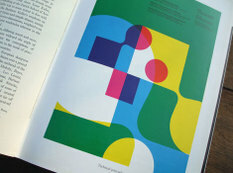 Volume 56 is packed full of great stuff: from the historical interesting but now obsolete technical advances of the day, through to both timeless and time-specific graphic design. For me, the stand-out piece is a title spread from the Saturday Evening Post feature "The Girl Who Hated Men", designed by Gene Frederico. Now on Flickr, Volume 52 is exeptional. 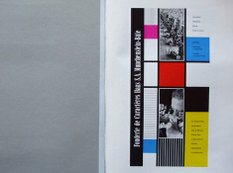 As well as being the edition that comes with that amazing Swissair leaflet, inside you'll find work by Ken Garland, Carlo Vivarelli, a certain Max Miedinger and articles on Ordnance Survey map production and "Advertising in the Atomic Age". There's a brilliant article called "Management training: the new concept" by Major-General C. Lloyd, specifically about the state of printing education at the time, lavishly illustrated with examples of beautiful typography, illustration and layout, including work from the Central School of Arts and Crafts (when Colin Forbes was Head of Department). A seriously dodgy cover I know but inside Volume 54 there's some special stuff, like that astounding Karl Gerstner designed ad. More on Flickr.